On Thursday, July 25, Russian Economic Development Minister Alexei Ulyukaev presented to the Russian government a plan for stimulating the country’s economy. However, experts say the plan's effects will be short-lived if implemented. Russia’s minister of economic development, Alexei Ulyukaev, asserts that the economy is not growing for several reasons: the fall in world trade volume, the “catastrophic” decline in corporate profits, increased labor costs and tariffs of natural monopolies. While presenting his proposal for growth, the minister stated that infrastructure projects, support for small and medium-sized businesses, open access to acquiring state-owned companies, and tax breaks for investors will improve the situation. Experts argue, however, that Ulyukaev did not take everything into account, and that his proposals will ensure only short-term growth. Ulyukaev views external constraints as being responsible for the slowdown in world trade. “World trade was a driver of growth for a number of years. […] Unfortunately, this is no longer the case,” said Ulyukaev. At the moment, the only impetus for Russia's economy within the country itself is income growth — but this is mostly a result of the increase in public-sector employees, as per May's presidential decrees. Ulyukaev says that the Russian economy's recovery period following the recent crisis ended over a year ago. In the first half of 2013, Russia's GDP growth was 1.7 percent less than last year's; unemployment has been on the rise in the past three months, and capacity utilization has been falling with it. Industrial output shows “virtually zero growth,” while investment activity shows a downward trend. “As for the decline in net exports, the line is also below zero,” the minister said. Ulyukaev also spoke about the deteriorating competitive edge of Russian businesses, corporate profits falling by over a quarter in 2013, and the growth of tariffs on natural monopolies and of labor costs against the backdrop of the real effective exchange rate. The economic development minister proposed financially supporting small and medium-sized businesses. 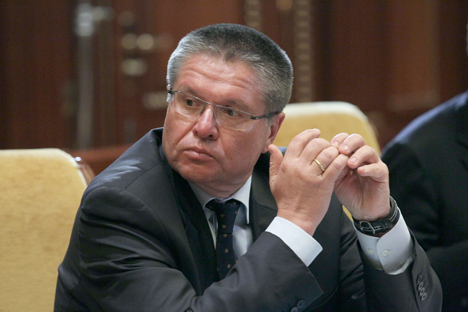 According to Ulyukaev, a federal guarantee fund could be established to supplement the existing system of regional funds for small businesses. Another one of his proposals is to use the National Welfare Fund (NWF) to support businesses. Ulyukaev suggests developing a set of criteria upon which projects would be selected to receive NWF and pension assets, increasing the availability of bank loans and refining the mechanisms for public-private partnerships. Also among his proposals is the extension of benefits for covering the costs of small businesses' insurance premiums. A preferential rate of 20 percent (originally 43 percent) for this category of entrepreneurs, introduced in 2012, will expire at the end of 2013. Ulyukaev also proposed expanding small and medium-sized businesses' access to acquiring state-owned companies and infrastructure monopolies. Russian Federal Antimonopoly Service (FAS) head Igor Artemiev announced at a conference in late July that small and middle-market companies received orders totaling about 700 billion rubles ($21.3 billion) in 2012. What did the minister forget? Experts interviewed by Gazeta.ru argue that Ulyukaev failed to mention other equally important constraints on economic growth, such as problems with the Russian business climate, the shortcomings of the judicial system, the state's excessive presence in the economy, a bloated budget and a sharp drop in small-business activity. “Ulyukaev did not mention the link between the slowdown in investment and state-owned companies' operations. He said nothing of the sharp decline of the small business sector due to smothering taxation. He did not talk about public sector bloat, or that public sector needs to be privatized,” says Valery Mironov, assistant director of the Higher School of Economics' Center for Development. First and foremost among limits to economic growth is the deplorable state of the business climate in Russia. Yet the suggestions for improving it involve enlisting the aid of other agencies that are not formally responsible for economic growth, says Gazeta.ru's Alexander Morozov, HSBC Bank's chief economist for Russia and the Commonwealth of Independent States. “The political factor should not be disregarded. The perception of the political situation in this country as a comfortable one in which to do business is, without a doubt, one of these factors,” says Morozov. Fisrt published in Russian in Gazeta.ru.